The Knopfs are the 2019 recipients of the Edith Bloch Award, presented every year by the Friends of the Hillel Library. Swampscott residents Diane and Eddie Knopf will be the recipients of the Edith Bloch Award at the 31st Friends of the Hillel Library celebratory event on Sunday, May 19, at Epstein Hillel School in Marblehead. The award is presented annually to recognize a member or members of the community for their commitment to learning and the pursuit of knowledge. Diane and Eddie’s broad involvement with both EHS and many other institutions have truly enriched jewish community life on the North Shore. In her 11 years as Epstein Hillel’s director of community engagement, Diane was instrumental in raising critical funds, producing all major events, managing alumni relations, creating publicity for the school and forging connections with all aspects of the community. She graduated from Simmons College and earned her MBA from Northeastern. Education and libraries have long been a part of her life, given that her mother, Ethel Miller, was a beloved second grade teacher, and she and Diane later established the Miller/Knopf Career Resource Library at Simmons. In addition, Diane’s mom generously funded the beautiful literary mural prominently displayed at the Swampscott Library Children’s Room. 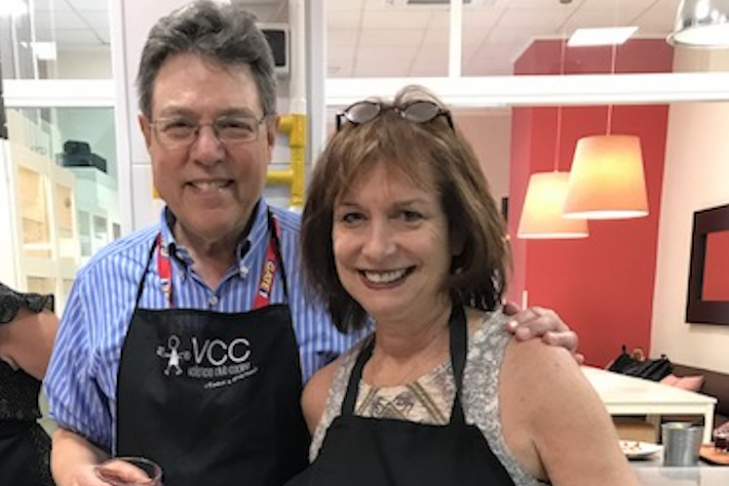 Diane’s volunteering includes serving as JCCNS president and current life board member, co-chair of two designer show houses and Sisterhood president at the former Temple Israel. She currently chairs the JCC Jewish Book Month Speaker Series, and together with Eddie serves on the JCC International Film Festival Committee. Eddie graduated from Lowell Tech, now UMass Lowell, before working as a mechanical engineer at Raytheon. After earning his MBA from BU, he opened Sir Speedy franchises in Chelsea, Boston and Brookline. In addition to serving as president of rotary clubs in Chelsea and Boston, Eddie was a member of the merger committee of Temples Beth El and Israel and has served on Congregation Shirat Hayam’s executive board. He is one of the daily “minyanaires” at CSH and can always be counted on to lend a hand, as he has on countless occasions for not only EHS, but the JCC and CSH as well. The program that evening is inspired by the Knopfs’ love of cooking, travel and connecting people. The event will feature Joan Nathan, whose latest cookbook is “King Solomon’s Table: A Culinary Exploration of Jewish Cooking from Around the World.” Nathan is the author of numerous cookbooks, including two that won the James Beard Award and the IACP Award for best cookbook of the year. She hosted the nationally syndicated PBS television series “Jewish Cooking in America with Joan Nathan” and is a frequent contributor to The New York Times and Tablet magazine, among others. She will be signing copies of her latest cookbook after the event. This event is open to the community at no charge. To RSVP, please call 781-639-2880 or email jrosen@epsteinhillel.org.